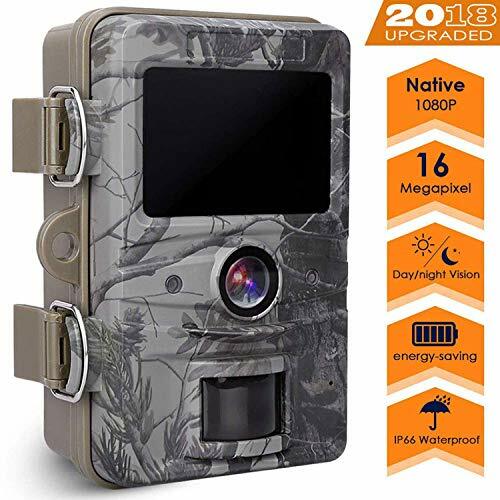  ◀ 16MP Image + 1080P Sharper Video Resolution ▶ This trail camera captures full HD 1080P video or max 16MP clear still photos each time motion is detected of wildlife game.With large aperture, full glasses, wide view angle, high resolution lens component,you could easily see the vivid world of wildlife. ⏰⏰⏰ ◀ Faster 0.5s Trigger Speed & Long Trigger Distance ▶ Once detecting the movements,an impressively fast trigger speed (0.5s) makes sure each detected movement is documented in real time.This hunting game camera can capture great night vision up to 20M/65ft in total darkness (black and white at night).We guarantee to never miss any shot of animals even 20 meters away,which is extremely crucial for hunting game and animal observation.  ◀ Excellent Sensitivity & 44pcs Upgraded Infrared LEDs ▶ Adapt fully automatic IR filter,the scouting night vision camera built-in 42pcs Low Glow Black Infrared LEDs – without bright flash,which can let you catch any moment even at dark night.You can get great shots of a passing animal in total darkness, without the animal realizing its being documented.  ◀ Upgraded IP66 Waterproof Design ▶ IP56 Waterproof housing ensures durability in raining condition,protects your hunting camera from rain and dust damage.And it also could work in tough environments like desert or tropical rain forest.With wall mount and tree strap, the trail camera can be securely attached to walls/ceilings/trees, It will record any animal movements you wanted even in rainy days.  ◀ Multiple Functions & Priority Warranty ▶ Password Protection, Interval, Time lapse, Motion detection, Timer-shot, Time stamp. Besides, with IP66 Waterproof housing ensures durability in raining condition,bringing this camera to multiple applications beyond your expectation.All AGM trail camera have 45 days no reason money back and 1 year guarantee, 100% satisfaction and zero hassle return guaranteed.If any problem please have no doubt to contact us. Email: service@agmhobby.com.